Every so often we get a question from a pregnant woman who is concerned because someone in her family (usually a parent or in-law) has shingles. She is worried that she may be at-risk to develop this as well. Shingles is caused by the same virus that causes chickenpox– the varicella zoster virus (VZV). Once you have had chickenpox, this virus continues to live dormant, inside your body. Sometimes, under conditions of stress or when the immune system is weakened, the virus can be reactivated. When this happens the virus does not cause chickenpox but shingles. Almost 1 out of every 3 people in the United States will develop shingles. Anyone who has had chickenpox may develop shingles, even children. But about half of all cases actually occur among people 60 years old or older. There is now a vaccine available for people over age 60 to prevent shingles. Shingles can only be spread by an affected person to someone who has NOT had chickenpox. If this happens, the exposed person will develop chickenpox—not shingles. Once you have had chickenpox, antibodies are in your system and you cannot get it again from someone else. But you will have the potential to develop shingles later in life. If you are pregnant, do you need to worry about shingles? Not if you have already had chickenpox or had the vaccine. Your antibodies will prevent the virus from multiplying in your body. However, if you are not immune to the virus and you are exposed to someone who has shingles there is a very small chance that you could develop chickenpox. Shingles is not spread through the air and infection can only occur after direct contact with the rash when it is in the blister-phase. A person with shingles is not contagious before the blisters appear or after they scab over. If you have been exposed to someone with shingles, and you have not had chickenpox or the vaccine, make sure you talk to your health care provider. Shingles is less contagious than chickenpox and the risk of a person with shingles spreading the virus is low if the rash is covered. If you have had chickenpox, it is possible to develop shingles during pregnancy. Although this is unlikely, make sure you seek treatment right away. The most common symptom is a painful rash on one side of the face or body. The rash forms blisters that typically scab over in 7–10 days and clear up within 2–4 weeks. There is often pain, itching, or tingling in the area where the rash will develop. Shingles can be quite painful but treatments with antiviral medications are available. These can lessen the severity and reduce the discomforts. Fortunately shingles in pregnancy is rare. 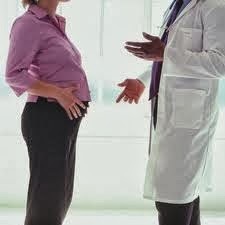 And, for women who do develop shingles during pregnancy, the prognosis is good.